While researching my latest and most wonderful (to date) book which if you have been living in a cave or Rochdale and haven’t heard is called ‘The Cat’s Travelogue’ I travelled the world and encountered strange people who erect bizarre signs in there very own edition of the English language. 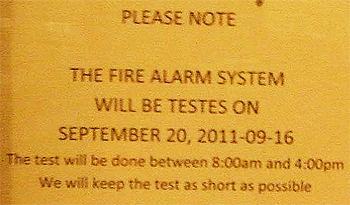 Ladies and Gentlemen I give you “Fire Alarm Testes!” from sunny smog filled Shanghai. What else can I add? Well I suppose the obvious what a load of rubbish, and did you see how long the brief Fire Alarm Test will take 8 hours! Mmh what an advanced nation!